CLASS OF 2018: The senior class reported substantially higher rates of cocaine use than other Bowdoin students. Nationally, 5.8 percent of college students report having used cocaine at some point in their life. Eleven percent of seniors have used cocaine during their time at Bowdoin, according to data from an Orient survey conducted this past December. Use of the drug among the class of 2018 substantially outpaces the other class years, and represents an increase from the last Orient survey on drug use, conducted in 2013. Across the entire student body, five percent of students have used cocaine at Bowdoin. 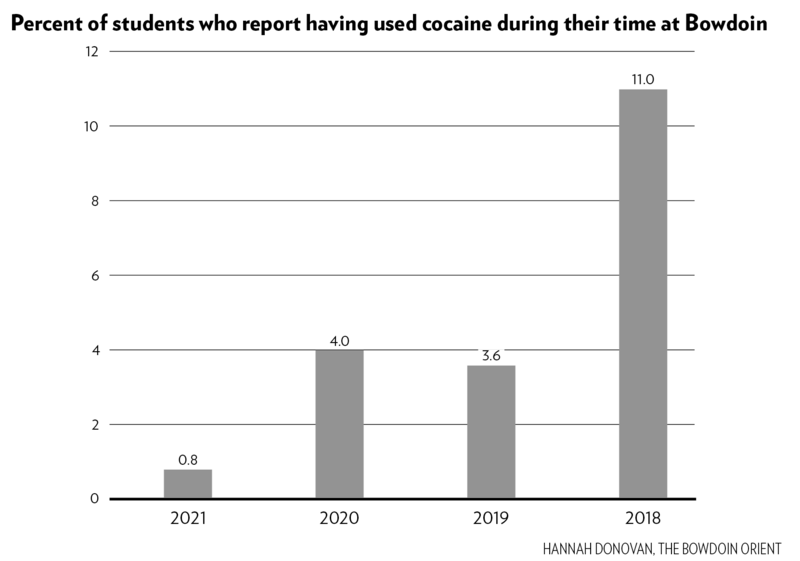 The sophomore and junior class reported four percent and 3.6 percent use respectively, while less than one percent of first years said they had used cocaine. The survey received 484 responses—27 percent of the student body—split close to evenly across class years. A similar Orient survey on drug use, conducted in 2013, found that 4.2 percent of the student body had used cocaine. In that survey, seniors actually reported a lower-than-average rate of cocaine use, at 2.7 percent. Several students spoke with the Orient on the condition of anonymity about their perceptions of cocaine use on campus. “It’s definitely around in a way that I haven’t seen in the past, and I don’t know if that means that I’m around different people than I have been in the past or if that’s something that has institutionally changed,” a senior male student said. Nationally, 5.8 percent of four-year college students report that they have used cocaine at some point in their life, according to a 2016 study funded by the National Institute on Drug Abuse and conducted by researchers from the University of Michigan. Dean of Student Affairs Tim Foster said that the 11 percent usage figure among seniors would represent an increase among Bowdoin students, but declined to make a judgment on the issue until the College conducts its own Health & Wellness Survey later this spring. The survey asks about a variety of behaviors including drug use. Bowdoin administers the Health & Wellness Survey to the student body every four years, most recently in 2014. That year, the survey received a 59 percent response rate from the student body, according to the Office of Institutional Research (IR). IR does not publicly release the Health & Wellness Survey results, but the College uses the data to inform health programs and services. “It’s filled out anonymously, confidentially, so people … hopefully feel like they can speak really candidly,” Foster said. Bowdoin’s Campus Crime Log, published by the Office of Safety and Security, does not list any incidents relating to cocaine use during this academic year. The report does list drug incidents related to student possession and use of alcohol and marijuana. Assistant Director of Health Promotion and Education Christian van Loenen said increased cocaine use is not something his office has noticed as a specific problem, but emphasized that the College has resources for students concerned for their, or a friend’s, drug use. “If you are ever, ever, ever concerned about a friend or concerned about yourself, that your first step is going to so many different places on campus. Residential Life is a wonderful first step, Health Services is a wonderful first step, counseling is a wonderful first step, the Dean’s Office is a wonderful first step,” van Loenen said. 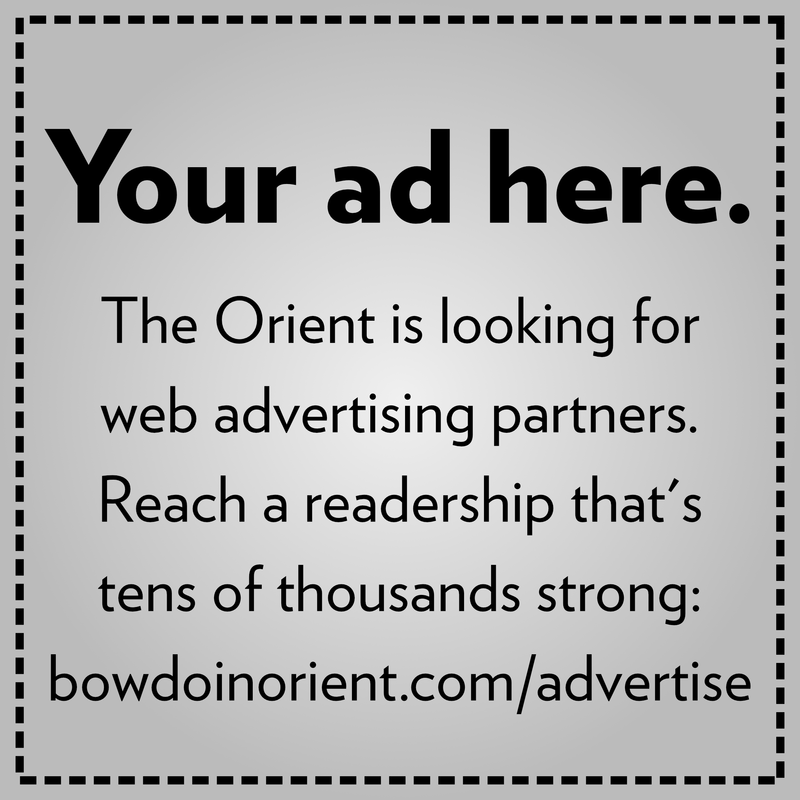 The Orient’s survey also found that marijuana and alcohol remain the most commonly used drugs among Bowdoin students. Fifty-three percent of students reported using marijuana at some point during their time at Bowdoin, and 83 percent had used alcohol. I’m stunned by this. When I was there, albeit years ago but at a time when cocaine was more popular, use was extremely low (anecdotally). I hope this is just an anomaly.